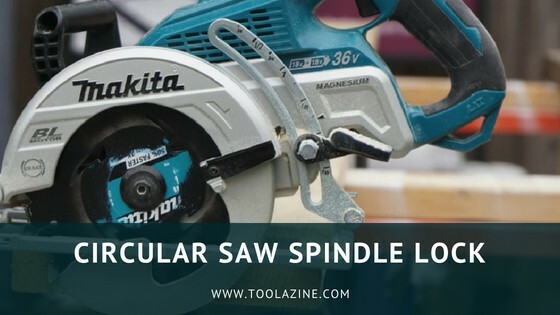 Toolazine What is spindle lock on circular saw? What is spindle lock on circular saw? Not only table saws, but drills and circular saws are also equipped with a spindle. The spindle lock has proven to be a very efficient and useful feature and there are many reasons why you need it. So, what exactly is a spindle lock on a circular saw? The spindle lock is designed for one thing – to stop the blade from turning so you can safely remove it. Once you push the button that activates this feature, the spindle lock blocks the blade and you are ready to start unscrewing the nut that holds the blade on. Do you really need a spindle lock? How to tighten the blade without a spindle lock? How to change the blade on a circular saw? Like it or not, almost every circular saw is equipped with it. It is widely known that this feature can help you with faster, and also safer blade removal. However, you will survive if your saw doesn’t have it. It isn’t the end of the world, but you will notice that it is much tougher to tighten or loosen the nut. Related – What is a circular saw? Every time when you are going to touch the blade with your hands, the first thing you will need to do is to unplug the saw. If you need to tighten the blade, tight the blade with your fingers as much as you can. Next, use a screwdriver and set it across the fence so the teeth of the blade are blocked to move by the screwdriver. Some blades have holes in them, so if you could put the screwdriver in one of those holes that would be much safer as the risk of the screwdriver slipping would be minimal. This should be enough to get the arbor bolt to pinch the arbor on the blade and you will be ready to start cutting. Which type of power source does your circular saw use? If it is a corded saw, make sure you unplug it. If you use a battery, remove the battery before you proceed. On the front part of the tool, you will notice a push button somewhere. That button activates the spindle lock and the blade will lock in place. In case the blade is covered with the blade guard, remove the guard as well. Once the blade is not moving, you can use the wrench that you get when buying the circular saw. You can use another wrench as well, but the one you get is the right size. Loosen the nut, remove it, and the blade will be free so you can take it out. Put the new blade and pay attention to the position of the teeth. Put the nut back and use the wrench to tighten it. This time, you will need to turn it into opposite direction of blade spinning. Plug the circular saw, or put the battery back and you are ready to use it. Although this seems easy, it is better to take a look at this tutorial for step by step explanation of what you will need to do. It is not rare to find a good quality saw without spending much money. But, what is considered as expensive? $200, $100 or $50? Whatever your budget is, here are top recommendations for each category. It has a 15 Amps motor, with 3700 RPM and you can cut through different materials with ease. It has a steel plate shoe which may not be the best pick, but all of the saws within the same price range come with a steel one. It is great for housing and it has one great feature that you need to consider – a spindle lock for easier and safer blade change. Interested in this model? You can check the full review, or buy the product here on Amazon. In case you want a cordless circular saw, then a model from Black and Decker would be the right choice. It has a high-torque motor with a fast cutting blade good for a variety of cuts. It is powered by a 20V battery, and you cut in different depth and width. It is a compact machine that is very easy to use. If you need more info, read the full review, or buy the product here on Amazon. Here you can find the full list of circular saws under (or about) $50. A powerful engine of 15 Amps with 5300 RPM designed by one of the greatest power tools manufacturer – what more can you ask for? A variety of different cuts that can be achieved within seconds, thanks to its extra sharp blade. For more information about this model check the full review, and if you already make your choice you can buy the product here on Amazon. If you prefer cordless tool, go for the Milwaukee model, with an 18V battery and up to 20% more run-time and more torque. At 3500 RPM, there are no problems with cutting different materials and thanks to the aluminum base plate you will have better stability. If you need more info read the full review, or proceed and buy the product here on Amazon. Here you can find the full list of circular saws under $100. Again, a Milwaukee model but this time – a corded one. This one has 15 Amps and can deliver up to 5800 RPM. It has superior blade visibility and aluminum crafted base plate shoe that offers maximum stability. It is comfortable and easy to use, and one of the best corded circular saws for this price category. You can read the full review, or directly buy the product here on Amazon. Best cordless, but also the best overall circular saw – the Makita XSR01Z is powered by two 18V batteries which give you a total power of 36V. However, you can run it with just one battery. It offers a maximum of 5100 RPM and it can make more than 500 cuts in a single charge. It comes with a magnesium base plate and it is an extremely durable tool. Read the full review, or simply proceed to buy the product here on Amazon. Here you can find the full list of circular saws under $200. To conclude, having a spindle lock feature is crucial for many power tools. You can use this article as a guide to better understand what the spindle lock is and how to use it to change the blade on your circular saw. What is your favorite model? Please add a comment in the section below and share this article.